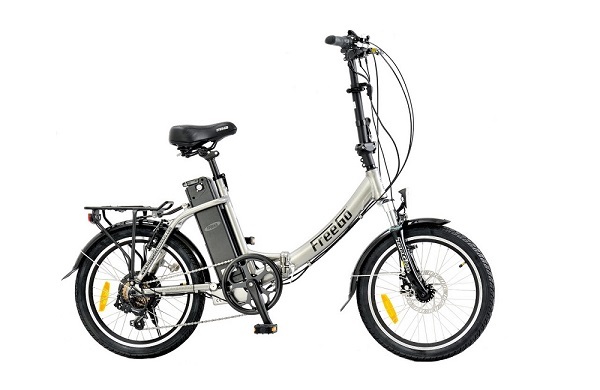 The FreeGo folding electric bike is one of most popular folding bikes on the market! 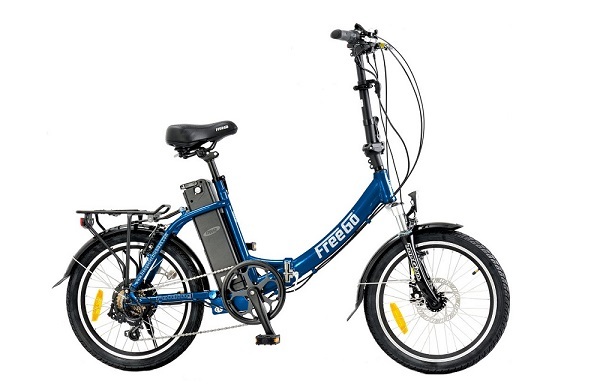 The FreeGo Folder combines the same powerful brushless motor, battery and electrics as the other electric bikes in the FreeGo range, with a compact and robust aluminium folding frame. It is therefore the ideal choice for the urban commuter, caravanner, boat owner or someone who simply wants to be able to pop it into the car boot and take off to the countryside for the day. When folded it can be easily stored in a corner of a room or office. The FreeGo folder comes complete with mudguards, LED lights, rear carrier, a comfortable saddle, and front disc brakes for extra stopping power. It is folded quickly and easily by unfastening just three clips, and opens up just as easily. Its 20″ wheels are fitted with trouble-free puncture resistant tyres, and the FreeGo Folder has an average range on a standard 10Ah battery of approximately 26 miles (depending on riding style and conditions of course). The bike has five levels of power assist, giving complete control over your speed. 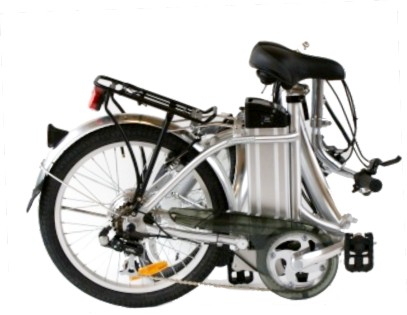 Alternatively it can be pedaled as an ordinary bicycle, with 6 gears. 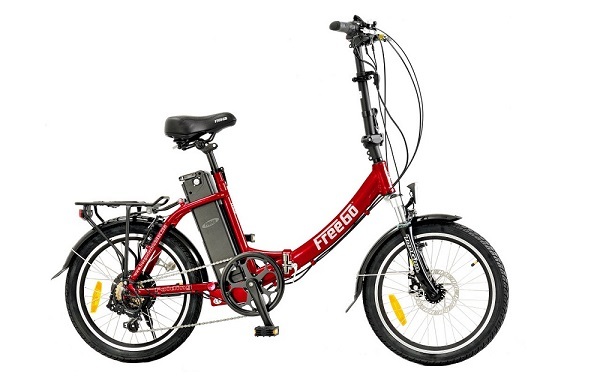 The FreeGo folding electric bike comes with FreeGo’s industry-leading warranty of 4 years on the frame, 2 years on the battery, and 1 year on the motor and electrics. Come and take a free test ride on the FreeGo folder at Ebike Centres in Leicester and see what all the fuss is about. 20" Diameter, aluminium deep V twin wall rims for extra strength. Stainless steel spokes. Aluminium lightweight rear rack with sprung holder. 20kg carrying capacity. Handle bar fold down to side of bike for easy storage. Height adjust using quick release. Lockable Lithium-ion 36v battery. Choice of Samdung 10.4 Ah (standard) or Samsung 16 Ah (super range). Can be charged on or off bike. Your FreeGo electric bike frame has a warranty of 4 years, the battery of 2 years. All other parts, with the exception of brake blocks/pads, tyres, lights and cables etc, have a warranty of 1 year. I'm Loving It! I've had my FreeGo folder for just over a month and I am LOVING IT! It's been a god-send in some of the recent hot weather, when I've been able to use it without turning into a sweaty puddle at the end of the ride. I work about 5 miles from home and the FreeGo means I can get to work in good time and I'm ready to get started without having to shower (we don't have the facilities) or change clothes. And riding it feels so serene - as though I'm gliding along like a swan. I even got to fulfil my dream of riding 'derny' for my bike club (Leicester Women's Velo) at the new Cycle Circuit in New Parks (see photo). We had such a laugh and they all insisted on having a go. Think I won a few converts! The guys at EBikes could not have done more for me, to make the trial ride, purchase and initial set-up such a smooth process for me. Liam's try-out route was an excellent introduction to electric biking and gave me such confidence I could just zip off on my own without worries. Keith and Greg have been great supports too, answering loads of my questions and sorting out the couple of niggles I had immediately. Although the bike is heavy, I'm able to get it easily into and out of the back of a small hatchback (once I drop the seat down), with the help of a handy short bungee to keep it from opening up (no fancy magnets or clips on this one). All in all, the best thing I've bought in a long while and definitely the right folks to buy from. Free go folder review I have only had the bike for 3 weeks and it is now January and bitterly cold so have only done a few miles so far. However what an amazing few miles it's been , I live in a very hilly village which seems to suddenly become flat , because this wonderful piece of kit goes up them like they don't exist it's really that easy. I'm amazed by it and can't wait for better weather so I can start riding to work. I have arthritis in my ankles and gave up cycling some years ago which I love dearly and now this hi tec machine has put me back in the saddle absolutely brilliant I can highly recommend this model to anyone and that goes for the staff at Leicester ebikes as well they are top of their game . John. Having recently taken up cycling again using my old bicycle, I found the hills around where I live difficult to handle. When someone recommended I look at electric bikes I was sceptical. However, Liam gave me a comprehensive test ride on the free go folder and I was hooked. I purchased this bike in September 2014 and have been very pleased with it. I feel confident to cycle most anywhere and the bike is well made and comfortable. Now that winter has arrived, I haven't been able to get out as much as I would have wanted as I do not like the cold weather. I really wish that I had bought it earlier in the year so I cannot wait for the weather to improve in 2015 so that I can make the most of my bike! I would highly recommend both this bike and the ebike centre - Keith and Liam are very helpful and knowledgeable. i purchased last month so for its good. good customer service at Leicester ebike center. i am very relaxed. i have recommended to my friends. the bike is very convinent . i think its is worth to buy this bike. I purchased this bike a few weeks ago and have already recommended this model to my friends. It's easy to fold away. have only had to charge it twice, and thats mostly using the throttle only. No more having to wait around for buses, plus already saved my first months payment in bus fares!!! I particularly like the fact that you have 3 ways in which you can ride this model - 6 speed normal cycle, pedal assisted and just the throttle (if you're feeling a little lazy) :). Not only is the bike a winner, the leicester ebike centre is the one to go to as you get 1st class customer service at all times. Keep up the good work lads.